Whether you’re a resident or a returning visitor, it’s natural to look for new things to experience while in Tampa. Once you’ve hit Busch Gardens, seen the Big Cat Rescue, and covered the extensive outdoor recreation opportunities, it’s time to delve into Tampa’s lesser-known destinations, from the unique to the downright weird. To help you get started on your planning, we’ve put together a list of a few of our recommended hotels and places to eat. 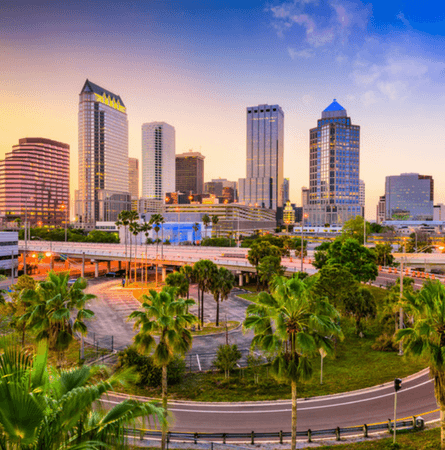 Since we know you’ve already seen all of Tampa’s beginner attractions, we’ve listed some interesting destinations to put on your itinerary to keep your next Tampa trip interesting. Keep reading to learn about where you should plan to go and how you should plan to get around the next time you’re in town! When you’re traveling with a group, transportation arrangements can be tricky. You can ask for volunteers to bring their cars and drive, but then you have to worry about splitting up payments for gas money, and your group can’t all travel in the same vehicle. With a private bus, everyone can travel together as a unit and arrive at each destination at the same time. All bus costs are rolled into your trip total, so no one will need to worry about evenly splitting up gas money-- the only extra cost will be your driver’s tip at the end. 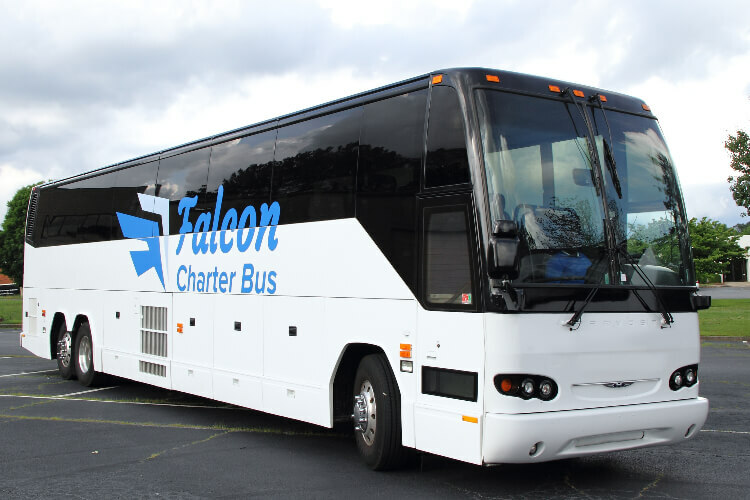 Falcon Charter Bus books buses of a variety of sizes, including minibuses with capacities of 18, 20, and 25 as well as full-sized coaches with capacities of 56. We can accommodate groups of all types, whether you’re just visiting Tampa on a personal vacation or coming in for a wedding or business event. Need multiple buses for your group? Let us put together a fleet just for you and handle all of the travel logistics. All you need to do is send us your itinerary and sit back and enjoy the ride. Our passengers love these local Tampa hotels, each of which offers a unique twist you won’t find at a chain hotel. Le Meridien, once a federal courthouse, features original architectural details such as marble columns and signs denoting the judge’s chamber. With 120 inspiring and comfortable rooms, event and meeting spaces, a restaurant and bar, and a fitness center, there’s little reason to leave the hotel during your stay. If you do decide to go out, your charter bus driver can easily take you to Ybor City (only 2 miles away), as well as other local attractions. Food enthusiasts, or those who just love to eat, will love the Epicurean Hotel in Hyde Park. In addition to its luxurious accommodations, the hotel features Élevage, an award-winning restaurant with modern twists on international classics. After lunch or dinner, head to the on-site patisserie Chocolate Pi or the roof-top bar for tapas and handcrafted cocktails. You and your group members can enjoy tropical gardens, spacious cabanas, and mouthwatering food at the Tahitian Inn, a historic boutique hotel in the Westshore District. Only four miles from Tampa International Airport, the Tahitian Inn is a short shuttle ride away from rest and relaxation. They even offer guests an in-house spa and a poolside Tiki bar to make you feel like you’re far from the bustling city. If you’re in the mood for something a little “off the beaten path,” these Tampa stops are sure to satisfy. Buy a freaky souvenir to shock your friends back home, attend an authentic Hindu service, step back in time, or explore an art exhibition made entirely of junk. Whichever you choose, you won’t be disappointed. 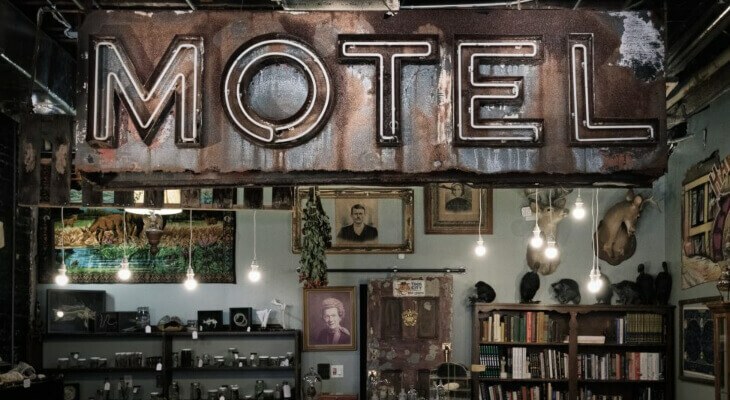 This oddities shop is full of souvenirs sure to shock, scare, and bewilder all visitors. Some examples include baby dolls in coffins, cursed antique jewelry, and mounted jackalopes-- and that’s just the beginning. Stop by for a unique souvenir sure to be a forever keepsake of your time in Tampa. While it’s available for events such as weddings and private parties, this is also a functioning Hindu temple where you can attend a service conducted in Sanskrit. True to Hindu tradition, there are no set times during which services are required to take place. The stunning architecture alone makes it a beautiful addition to your itinerary, even if you’ll only see it in passing. Walk through a wonderland of Victorian tourism artifacts, furniture, and architecture when you visit the Henry B. Plant Museum. Once a thriving hotel with over 500 rooms, the building now houses educational exhibits of Florida’s tourism industry, the Spanish American War, and Tampa’s own personal history. This fishing shop now doubles as an art center, featuring what used to be trash on display throughout the property. The owner, Hong Kong Willie himself, has deemed the art style “reuse art.” Visitors can receive a personalized tour upon arrival, leading them through the history of the shop and all of its unique oddities. Don’t forget about recreation while you’re planning your itinerary! There are plenty of opportunities to enjoy the outdoors in Tampa, from a spooky ghost tour to a pirate parade to electric boats in the Bay. After a tiring day of exploring, your private bus will be waiting to pick you up and take you back to your hotel for some much-earned rest. eBoats Tampa gives guests the opportunity to sail the Bay in their own environmentally-friendly electric boat! Guests can drive the boats themselves or hire a driver, and even bring aboard their own snacks, drinks, foods, and music. Bring as many boat carry-ons as you’d like-- you’ll have plenty of space on your bus as well to store all that you want to bring. Each January, the Gasparilla Pirate Festival hosts various parades and community events in honor of the mythical Spanish pirate José Gaspar, otherwise known as Gasparilla. The series of alcohol-free events runs until March, with notable events including the Parade of Pirates and the Gasparilla Children’s Parade. Delve into the spooky history of one of the nation’s most haunted cities with the Ybor City Ghost Tour. This 120-minute tour covers a haunted basement, a ghostly shopkeeper, a boy who has haunted the Cuban Club pool since his untimely death, and more. You’ll be happy to have a private bus to take you home after an evening of walking! On your next trip, skip the chain restaurants and support a few local eateries, each with a fun twist or unique dish. These recommendations serve up unbelievably delicious meals in beautiful settings. Set in a European-style 19th-century building near the University of Tampa, Oxford Exchange provides visitors with a gourmet coffee bar and restaurant, a bookstore, gift shop, and more. You’ll find fresh takes on American dishes in an atmosphere unlike any other in Tampa. Inspired by traditional Native American foods, Ulele offers diners dishes that are as appetizing as they are visually appealing. Many of its menu items are prepared in front of guests on a ten-foot barbacoa grill, and you can enjoy your meal inside or outside with a waterfront view. If you’re looking for a more laid-back experience, add Skipper’s to your itinerary. At this iconic restaurant and music venue, you’ll find “Floribbean” cuisine, like their famous Blackened Grouper Reuben (featured on the Travel Channel’s “Best Sandwich in America”) and gator chili. Want to get out of Tampa for the day? There are plenty of interesting things to see around the Bay-- and you won’t even have to travel that far to find more things to do! Located near Tarpon Springs’s Historic Sponge Docks, Spongeorama is a collection of-- you guessed it-- sponges straight from the bay. 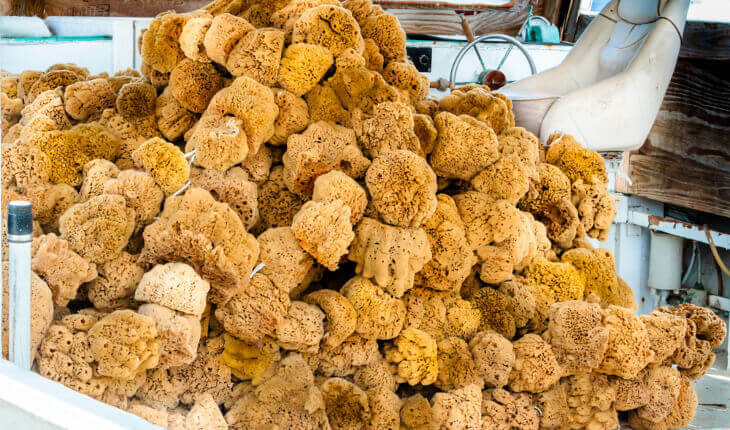 This shop boasts the world’s largest collection of natural sea sponges, available for decor or for personal use. Also offered in the shop are arts, jewelry, gifts, paintings, and more. Excluding that of Europe, St. Petersburg’s Salvador Dalí collection is the largest in the world. Here, you’ll find rotating permanent collection displays featuring 96 oil paintings, over 100 drawings, and 1,300 graphics, photographs, sculptures, and more. Temporary shows are also exhibited throughout the year. Dinosaur World features hundreds of life-sized dinosaur models for viewing in a natural setting. You can stroll through the grounds and admire these fascinating creatures while stopping at interactive educational exhibits along the way. There’s plenty of room to stop and enjoy a family picnic, so bring along your own basket full of food! Planning to visit other cities in Florida? Falcon Charter Bus also directly services Orlando, Miami, Fort Lauderdale, Jacksonville, and more! Rely on us to get you exactly where you need to go, no matter what you're traveling for. Ready to book your bus? Falcon Charter Bus is here to make your next Tampa trip comfortable and enjoyable through seamless, hassle-free transportation. 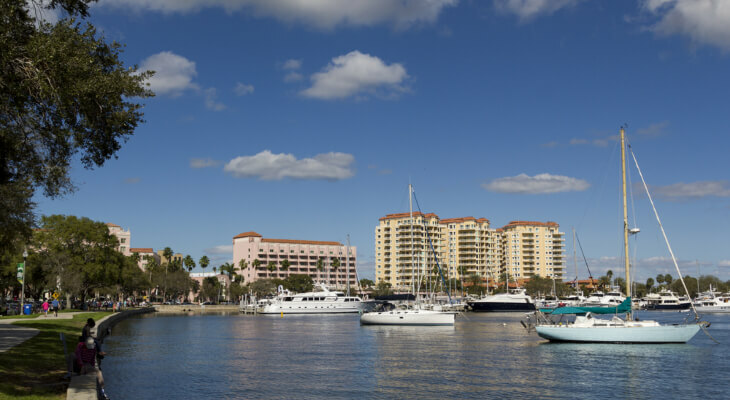 Whether you’re just passing through or planning your own Tampa vacation, we’ll help organize all of your group travel. Our 24-hour reservation specialists are always available to help plan your travel arrangements and find the perfect vehicle for your group. Give our team a call at 813-944-3146 to receive a free quote and get started on your trip planning!